I am happy to have my entry entitled "Advice From Dad" chosen to be included in the Polo Player's Edition Magazine's 23rd Annual Art Issue. The theme for the entries was to communicate the feeling of "connection". This was a competition that was juried by the editors. 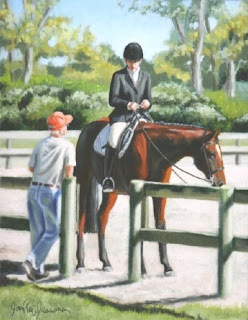 The reason that I entered this particular painting was because of what I saw between this young rider and the Dad at a horse show. I wanted to express the feeling that horse and rider teams are backed up by dedicated parents, friends, trainers, grooms etc........ a long list of "connections" for sure. Thanks Polo Player's Edition Magazine......I'm honored to be part of this yearly tradition ! Last Sunday morning I hugged my family goodbye and stepped OUT of my comfort zone. I flew to Scottsdale Arizona to the Scottsdale Artists School. I have never been to Phoenix and was surprised by the size of the city. It's huge. The desert surroundings were a dramatic change from where I had been the day before at Beech Grove, Tennesssee. My reason for going to the school was to take a workshop from Greg Beecham, a very successful western wildlife artist from DuBois, Wyoming. The School is a wonderful place to take a workshop and I would highly recommend it to anyone considering taking a class there. You can stay nearby within walking distance of the school and restaurants are also within easy access. I did rent a car but in hindsight I could have managed without one. The class had 11 students which made it great for observing Greg's demonstrations. He was very forthcoming with lots of information about his approach to oil painting and his career in general. This included technical info plus lots of great tips on dynamic compositions , brushwork and color harmonies, with an emphasis on the expression of light. Workshops usually have a way of energizing an artist. I've included 2 photos. One is of Greg during a demonstration and the other is a hallway of the school with that wonderful southwestern light pouring in. The building itself is a perfect combination of wonderful light filled studios. It used to be a one story elementary school and the changes that they made kept the convenient flow to the space while showcasing that southwestern architecture on the inside and out. Gee....can you tell I liked the place ? So, don't hesitate to sign up for a workshop there. Hopefully you'll be as pleased as I was with the experience. Last week was a busy one. It started with a great weekend with my son coming home for a whirlwind visit from college. He went with me to the much anticipated opening day festivities and the blessing of the hounds for The Beech Grove Hunt . 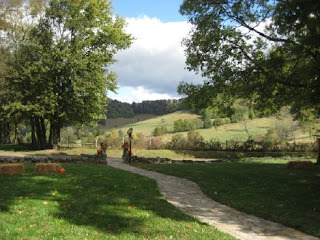 It was a glorious morning in the hills of Tennessee with welcoming hosts Dale and Elese Alsup ( MFH of Beech Grove Hunt). The picture here shows some of the hills I'm talking about. What can I say...a sight that's good for the soul ! I'm smiling just thinking about that morning full of the sights and sounds of hunting and being so welcomed by a great group of people.